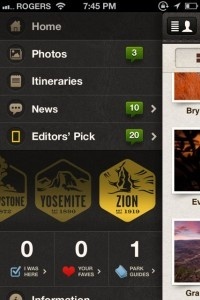 National Parks by National Geographic updated their app to a universal build in time for late summer travel. If a trip to any of the 20 most popular parks across the US is in the planning stages, this app is a great place to begin. While the feature set is less comprehensive than those found in traditional travel guidebooks, there’s just enough information here to set a plan in motion. And, if travel isn’t on the horizon, National Parks is packed with enough of its signature stunning photography to ignite anyone’s wanderlust. From Maine's Acadia to Hawaii's Volcanoes, National Parks, offers users a free glimpse at a few awe-inspiring pictures and some basic information like live weather and visitor stats for all the included parks. While the app is free to download, unlocking individual travel guides is necessary to access most features. One park of a user's choosing is included free, and the rest can be purchased in-app for between $.99 and $1.99 each. Once downloaded users get a fuller photo gallery along with interactive maps that can be sorted by season and activities, points of interest, intriguing facts about each destination and National Parks' best selling point – photography tips from veteran Michael Melford. The app also allows users to personalize their guide with photos of their own. 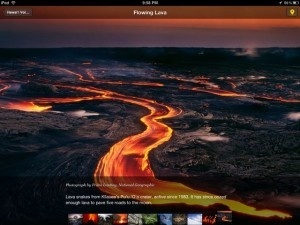 The iPad interface is beautiful, with rich full-screen photos and an intuitive layout. The iPhone UI, while less like a coffee table book, avails itself of the available screen space well, using a split page design for navigation and the same luscious Retina-display photography. Once individual guides are downloaded there is a lot to explore, but National Parks By National Geographic won’t replace a practical guide for finding the best or cheapest accommodations, booking flights, or for detailed itinerary planning. And the app only covers 20 of the almost 60 national natural playgrounds. But, the breathtaking photography, appealing UI and the ability to turn the app into a travel journal of sorts makes it an ideal selection for anyone interested in America’s protected environmental treasures.